Thua Thien-Hue (VNA) - Farmers in central Thua Thien-Hue province have started breeding eels to prevent the fish species from becoming extinct. According to a report of the local agriculture sector, freshwater eels are dwindling in population owing to large consumption. Eels caught in natural waters are the top choice for nutritious dishes as people are wary of consuming meat and fish produced in farms for fear of contamination. This is leading to a shortage in supply of eels in the local market. 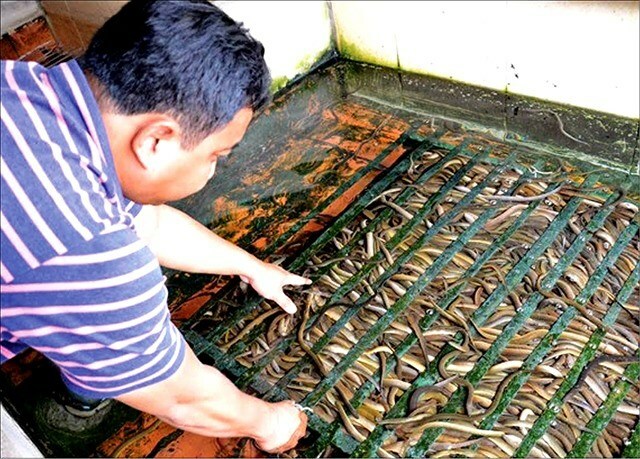 Farmers in the province’s Quang Dien district, which is the main source of naturally caught eels, started breeding an eel variety born from natural eels two years ago. The practice was first started by the province’s agriculture promotion centre, which studied eels and made them breed in mud-free man-made ponds. The centre then shared this knowledge with the farmers in Quang Dien district in late 2015. Nguyen Thi Minh Hoa of the district said a group of farmers were selected for piloting eel farming in 2016, which showed good results. “Last year, we spread the model throughout the district as the demand for eels for food consumption was high. Unfortunately, the eels were swept away in the floods in November,” Hoa said. She insists on continuing eel farming this year. Hoang Re, an eel breeder, secured his eel ponds during the floods. His eels grew well in the man-made ponds and gave birth to many baby eels, which Re sold to local farmers. “It is not difficult to raise and breed this variety of eel,” he said, adding farmers could do it well as he himself was a retired teacher. Re said breeding eels in March will result in baby eels in May. The breeding season continues till September until the cold spell. According to Re, a group of mother eels weighing 45kg can give birth to 4,000 babies at one crop. He said the agriculture promotion centre also fed the eels with probiotics to hasten the breeding process. Ponds for breeding eels are made of iron tubes that act as frames and large plastic sheets that act as the cover. Some farmers cover the top of the pond with climbers or dry leaves to create shade and keep the water cool. Farmers also put ferns in the water so that the eels can hide. Nguyen Tu, a farmer breeding commercial eels in the district, said eels did not require much care and that eel-breeding left ample time for other farming jobs. “This helps improve my income as it is not time-consuming. The percentage of commercial eels in these mud-free ponds is much higher than the mud eels I have tried in the past,” said Tu, who refused to share his annual profit. Eel wholesale traders at the local Sịa Market said they could not distinguish between the naturally caught eels and those bred by farmers.